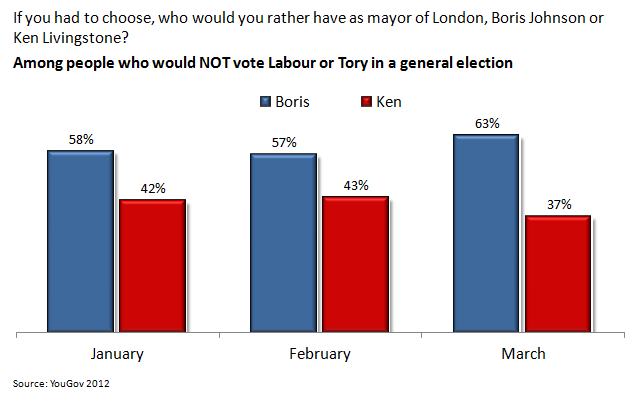 The latest London mayoral poll puts Boris on 54%: the largest lead for any candidate this year, suggesting a 3pt swing from Ken. The change may just be random fluctuation: with London polls still only coming about once a month it’s hard to be sure. But it would also make sense that we’re seeing an impact from the accusations about Ken’s tax dealings, which broke before the poll was conducted. Regardless of what’s caused any swing, the combined polls this year demonstrate two key issues that are determining how the race is working out. 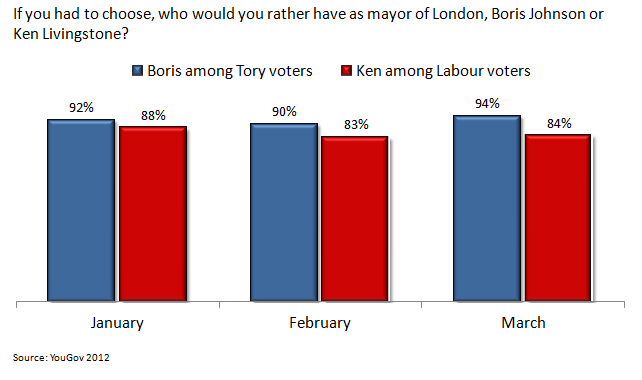 Given that Labour’s vote is generally much stronger than the Tories’ in London – yet Boris and Ken are roughly level – it’s not surprising that Boris is doing better among his party’s supporters. Labour’s vote across the country has increased by several points since the March poll was taken. Given the closeness of the London race, this could make a crucial difference, but the lower conversion rate of Labour voters into Ken voters could reduce the benefit to the campaign if the same reluctance applies to ‘new’ Labour voters. There’s a striking difference in where each candidate’s support comes from. Despite Ken’s relative weakness among Labour voters, a much higher proportion of his voters are also Labour supporters than Boris’ voters are Tory supporters. In fact, less than two thirds of Boris’ support comes from Tory voters, while five in six Ken voters are also Labour supporters. Income tax cut for top earners: political suicide for the Coalition? Posted in Politics on March 18th, 2012 by Leo – Comments Off on Income tax cut for top earners: political suicide for the Coalition? ‘Bafflement’ is the best word for the commentariat reaction to the suggestion that George Osborne will cut the top rate of income tax in this week’s budget. Normally reliable admirers of the government’s political tactics are astonished that the Chancellor is planning the cut. In his Telegraph blog, Dan Hodges suggested the move would spell the end of Osborne’s career. The Express’s Patrick O’Flynn tweeted that it would be ‘political disaster for the Tories’. Recent polls suggest they are absolutely right. 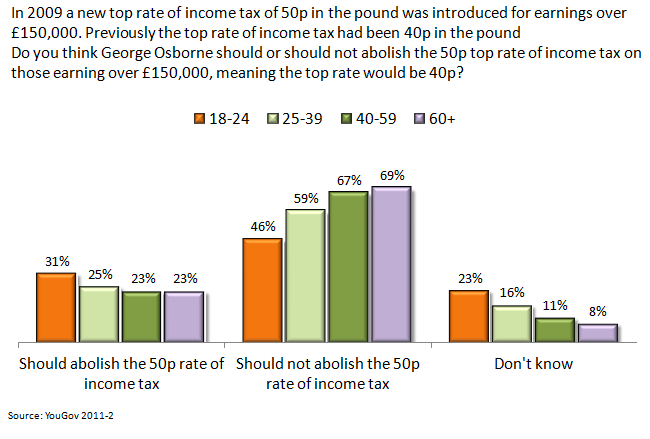 From what we have heard so far, the change to the top rate seems on course to be extraordinarily unpopular. 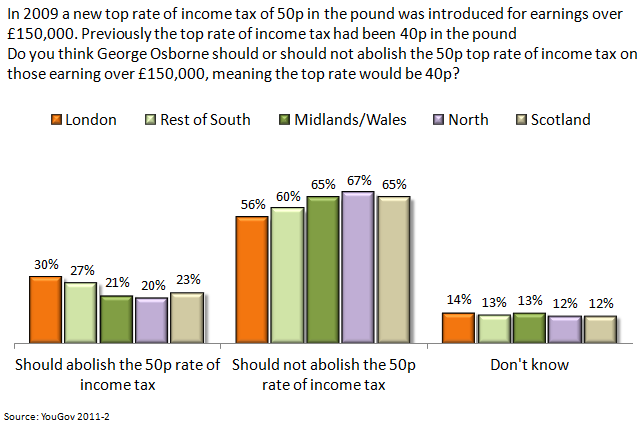 The latest poll on the change, from YouGov, found that only 1 in 4 support a cut, with more than twice as many opposed (this asks about a cut to 40p rather than the likely 45p; I doubt that would make much difference). But this only begins to touch on how politically difficult the cut would be. 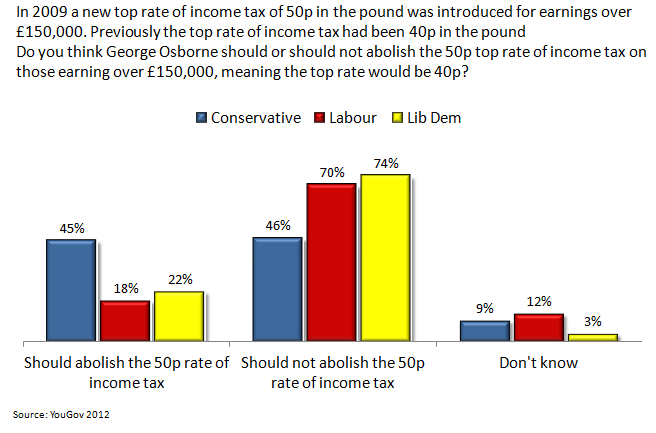 It’s no surprise that the Lib Dems’ remaining supporters really don’t like the proposal, indicating problems for the Coalition ahead. In fact, a more detailed look at views of the plan suggests even bigger political problems for the government. What can protest movements learn from Occupy London? Posted in Protests on March 11th, 2012 by Leo – Comments Off on What can protest movements learn from Occupy London? There are two ways of looking at how the country saw Occupy London before its eviction at the end of last month. The first is that the principles of the protest were surprisingly popular. We saw in October an ICM poll that found a majority sympathetic to the protesters’ aim of ending ‘a system that puts profit before people’. Fewer than two in five said that the protesters were naive in looking for an alternative to capitalism. The surprise isn’t that the country thinks that the current economic system is unfair. We already knew that there is an overwhelming view that those who play by the rules don’t get rewarded. What is impressive is that Occupy London succeeded in tapping in to this. Despite not making specific proposals for reforming the economic system, and having their message diverted by fights about tactics, the protesters’ desire for something better than the current system was recognised and shared by a large proportion of the population. Whether this support meant that the protests changed anything is another question. The same YouGov poll also finds that 71% think that it didn’t achieve much or anything at all. This seems harsh. While difficult to measure, one likely success is that the protest prompted media debates about whether the economic system can be reformed, which created political space to consider it in a way that hadn’t previously existed. It may also be true that the protests inspired and informed new activists, who will continue to fight for economic and political reforms. But while the protests may have achieved some things, it’s hard to avoid the conclusion that the tactics of Occupy London got in the way of its achieving more.